If you're a regular over on our reviews channel you'll know what we like and what we like ... less. 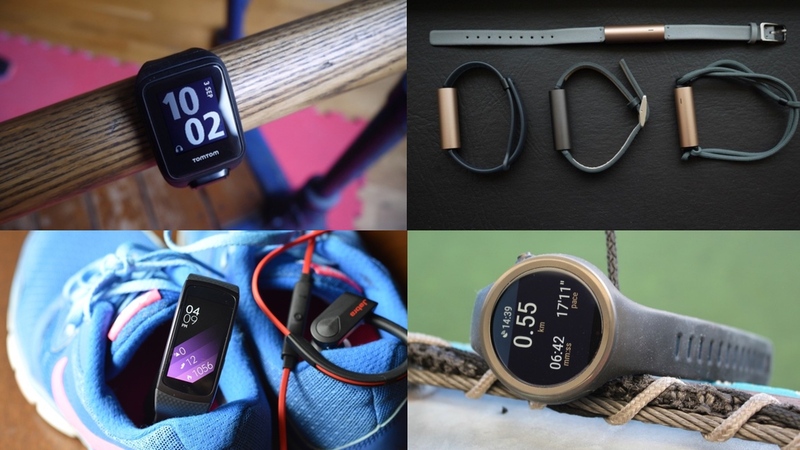 But which are the wearables that we wear day in, day out? Which devices do we go back to when we're not testing anything? Which do we personally endorse? Last year we were wearing Withings watches, the Fitbit Charge HR and the LG G Watch R. How times have changed. But there's also some examples of tech that we just can't quit too - ancient Adidas watches and the still awesome Gear VR. Here's what the Wareable.com editorial team is wearing. There's a lot of great running watches out there, especially from Garmin, but the one I always go back to is the TomTom Spark. It's the easiest to use, GPS signal is always reliable and while the software is still terrible, connecting it to Runkeeper is a good solution for now. I've also started using it for swimming as well. It doesn't give you as comprehensive metrics as a dedicated swimming watch, but it's accurate and means I don't have to carry around another watch in my bag. The surprise package for me is the Atlas Wristband. Weight training comes secondary to running and swimming, but I've started to add some sessions to my weekly routine. I never thought I'd be sold on a wearable that you only wear during a workout, but the rep counting on the Atlas is great and the heart rate readings seem reliable as well. I just wished it wasn't so odd looking. I'm still a sucker for Android Wear and I'll rotate through the Huawei Watch, the Moto 360 Sport and the Sony SmartWatch 3. It's not a perfect OS by any means but I've been impressed with the tweaks Google has made in the last few months and I'm super excited about the changes that will come with Android Wear 2.0. With multiple devices now supported in the Android Wear app it's a doddle to switch between different models based on my mood / outfit. Regular readers will be aware that I wasn't a huge Apple Watch fan from the off, but my love for Apple's timepiece has improved as time has gone on. For a couple of months I wore the Watch exclusively and was very impressed with Apple Pay, in particular. However, the need to be paired to an iPhone was too much for me. I've nothing against Cupertino's smartphone, but I'm an Android man. It'd be great if the next Apple Watch allows cross OS connectivity. Believe it or not, the smartwatch I keep coming back to is the Apple Watch. Despite the frustration I've experienced over the last year of all the things it can't do, I still believe it's the best smartwatch out there. The lack of GPS, appalling sports features and general app crappness is mitigated by the excellent design, the wonderful selection of third party bands (which are super-easy to swap) and watchOS 3 which is looks to finally solve much of the Watch's performance shortcomings. It's far from perfect, but I find that it ticks off more functions of a real watch than any other wearable device. I'm proud to wear it, it can be customised to an outfit, it says something about who I am. While the TomTom Spark is my favourite running watch, the Vivoactive HR is just my perfect device. With running, golf, cycling and walking all tracked from the wrist, the Vivoactive HR fulfils pretty much every aspect of the sports I actually do. While the Fenix 3 previously held that crown, with heart rate on the wrist, that data is so much richer and the device is so much cheaper. I've been a big fan of Moov since the beginning and it's still an essential part of my life. After a brief hiatus, I'm back training with Moov Now again. The interval training approach to running (with plans for speed, endurance and form) are fantastic, as are the 7 Minute workout sessions, too. The only beef is that it's meant a return to running with a phone. But it's not designed for every run and the tangible improvements from the sessions are well worth that downside. My two go-to's in between testing are the Misfit Ray and the Pebble Time Round. Both require minimal effort on my part, especially the Ray which doesn't need charging, and they're also both light, comfortable to wear and don't look super dorky on my wrist. When it comes to everyday wearables, that's what keeps me coming back to certain devices, once reliability is covered off. Pebble is still the smartwatch OS that I find actually saves me time, though when watchOS 3 lands properly I think that might just be enough to finally convince me. I'm looking forward to the new Ray accessories coming this summer to customise it further. The tracking and Misfit Move is enough to give me a picture of how lazy I'm being which is the most important thing. Plus it'll vibrate when I get a call or message and tapping hooks up to Spotify and Hue controls. A couple of shout outs to the wearable tech I use at home, too. The Here Active Listening buds are great for when I want to listen to music in my room but noise cancel impromptu, mid week parties in my flat. And the Samsung Gear VR is still just such an easy virtual reality headset to show to people who haven't tried it yet and dip in for a bit of VR time myself. I just wish my S6 Edge wasn't quite so scratched up. Lately, I've been wearing the Samsung Gear Fit2 nonstop simply because it's a nice mix of smartwatch and fitness tracker with a great screen that nicely displays all my notifications. The battery life isn't great and paired with the awful battery on my Galaxy S6, it makes for an annoying combination. But while not perfect, I've still enjoyed using it. I also usually wear my Apple Watch when going out to meetings. It's the easiest smartwatch to work with my iPhone and I feel like I get the most out of it. I've found the microphone to be most handy when I need to answer phone calls in a pinch but can't because I'm driving. Off the wrist and at home, I'll happily jump into my HTC Vive - which is also my go-to when I have guests over so they can experience VR for the first time. The reactions are always priceless when I tell them they can walk around and 'touch' things that aren't really there.